Granola Cookie Bars: Melt 1/4 c. butter in a heavy skillet and toast 2 c. oats, stirring often, for 6 minutes over medium heat. Transfer toasted oats to a large bowl and add 1/2 c. flaxseed meal, 1/2 tsp. cinnamon, and 1/2 c. raisins, finely chopped with another Tbsp. flaxseed meal (to keep your knife from sticking). Mix everything up with the oats. Wipe out your skillet and return it to medium heat, adding 1/2 c. honey, 1/4 c. dark brown sugar, 1 Tbsp. unsulphered (not blackstrap) molasses, and 1 tsp. kosher salt. Cook syrup 6 minutes, stirring occasionally. Pour syrup over oat mixture and stir well to combine. Transfer mixture to a well-buttered 9×9 (or 7×11) pan and press them firmly into an even layer. Bake at 325 for about 25 minutes, rotating pan after 15 minutes, until the edge of the pan is a little darker than the middle. Cool 15 minutes, then cut into 16-20 bars and cool on a rack. These would be good for me, b/c I am notorious for eating *part* of a granola bar and then putting it back in the wrapper and losing it in the cupboard for months. One of my most endearing qualities according to my husband. These are perfect, then! I recently made a pan of granola bars and cut them into 1.5″ squares for a kindergarten potluck. There’s so much more flexibility when you DIY. Those granola bar manufacturers are not thinking of you at ALL with their package sizes! I hope you liked them if you tried them! I’ve tried many, including this one. For a while I was hot on Mark Bittman’s no-bake ones. My current favorite is the King Arthur Flour granola bar, which recently appeared in Smitten Kitchen. Ok, so I tried those King Arthur granola bars on your recommendation, using SK’s reduced amount of sugar but the 9×13 pan from the KAF recipe. They were deeeelicious but didn’t hold together well. Which version of the recipe do you use and what size pan? I am definitely going to do some tinkering with that recipe until it holds together as well as this one! I think the secret here might have been boiling the syrup, maybe I can work that in. They look like they turned out perfectly! 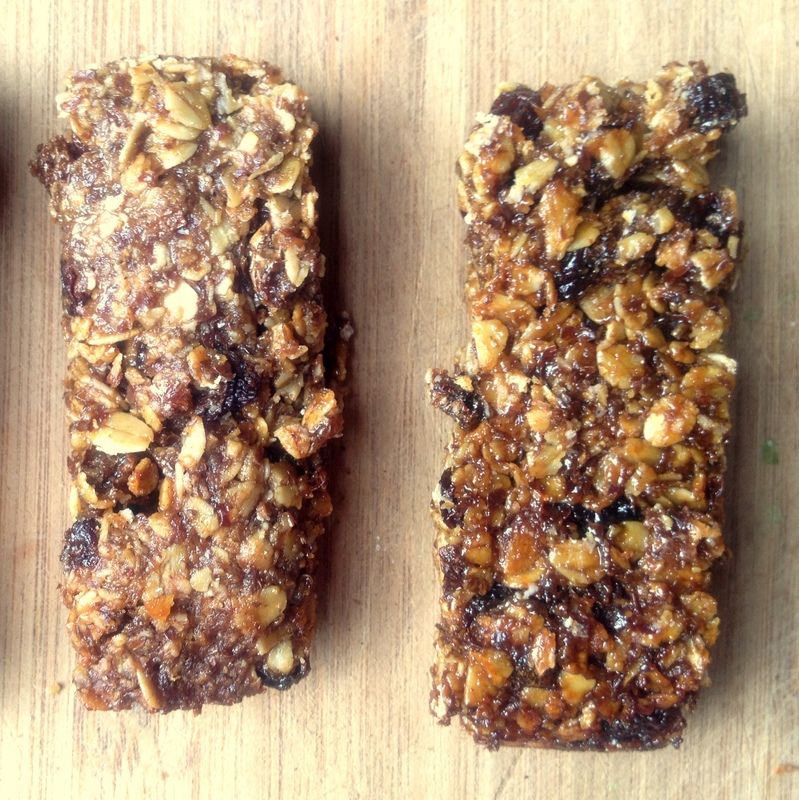 I have been a little scared to try making granola bars after reading David Lebovitz’s granola bar fails (do you read his blog? ), but this is really encouraging! Looks like it! Will have to give them a try. Poor Lebovitz. His granola bars always look so tragic! “Basically cookies.” Yes, you’ve got it. They look great! Oh my gooey goodness. Bookmarking now! Hey, I haven’t run since Ragnar ;) I can’t think of a better way to spend my day!